This learning path is for software developers who want to become proficient at using the Git version control system. A basic understanding of any version control system would be beneficial. Moving forward, you will gain deeper insights into Git's architecture, its underlying concepts, behavior, and best practices. It gives a quick implementation example of using Git for a collaborative development of a sample project to establish the foundation knowledge of Git operational tasks and concepts. 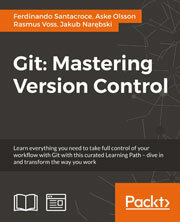 By exploring advanced Git practices, you will attain a deeper understanding of Git&apos;s behavior, allowing you to customize and extend existing recipes and write your own. Its step-by-step approach with useful information makes this course the ultimate guide to understanding and mastering Git. This course will show the road to mastery example by example, while also explaining the mental model of Git.